The new concrete blocks might even be good for sitting. 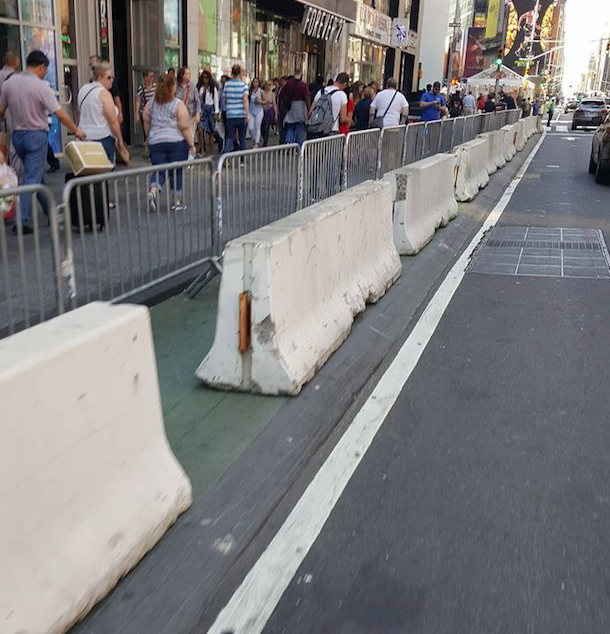 A few months after the city built a raised bike lane on Seventh Avenue to create a bicycling bypass around the Times Square plazas, NYPD closed if off with barricades in response to a fatal vehicular attack. Seven months later, the bike lane segment is free and clear, shown in this photo shared by a reader. Was this really the most sensible solution? NYPD’s Midtown security theater escalated dramatically after the October West Side Greenway attack. 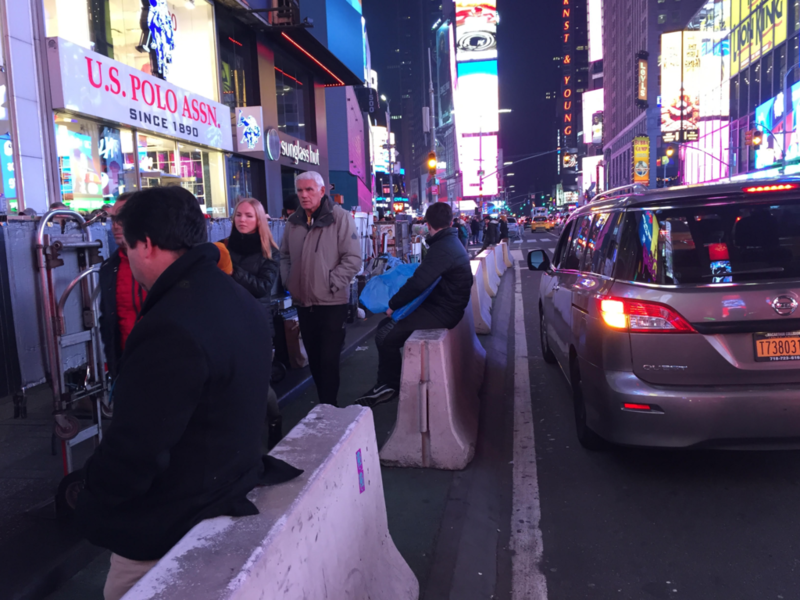 Not all of the Seventh Avenue fencing remained in place through the end of 2017, but much of it did, and police continued to park in the bike lane. Police finally seem to be adapting their barrier placement to how people outside of cars get around Midtown. While the replacement concrete blocks on Seventh Avenue are chunky, they occupy the utility pole zone on the sidewalk. They might even be good for sitting, which is what the people want. Space in Times Square is allocated, in descending order of size, to (a) pedestrians, (b) cars, (c) bicycles. For that reason, I have no qualms about trading away pedestrian space in favor of bicycles. The barriers will also help keep tourists from stepping into the bike lane while staring in the sky and waving their selfie stick randomly. Pedestrians in Times Square vastly outnumber both motorists and cyclists. While pedestrians have the most space overall, they have the least space per person. Times Square cyclists certainly shouldn’t get the space they need at the expense of pedestrians who need it even more. I rode down there the other day and when I got over 43rd st there were two traffic cops stood right in the bike lane, completely blocking it. Heavy traffic to my right, weaving around them wasn’t an option. They were doing some kind of paperwork, one of them had a clipboard. So I dinged my bell. Nothing. Stopped right in front of them and they both turned my back to me. Said “excuse me” three times with no response. Said “can I get past, you’re blocking the bike lane” and one of them glanced over his shoulder, shook his head and went back to what he was doing. So I just stood there dinging my bell over and over. Eventually the lady cop turns around, rolls her eyes, and steps out of the way. As I rode past I said “for f*cks sake” and she yells at me “SIR. SIR. THERE AIN’T NO NEED FOR LANGUAGE.” What did she expect? Some of these cops truly are the most insufferable, unprofessional, contemptuous douchebags imaginable. Oh and I’m still seeing FedEx and USPS trucks parked on the bike lane just before 42nd, right outside the Times Square precinct. It’s the most brazen act of thoughtless ignorance, and of course no problem for the drivers since the NYPD doesn’t see anything wrong with it whatsoever..
A pedestrian clearly needs less room than a cyclist, if we’re talking on a per-head basis. And both a cyclist and a pedestrian need less room than a motorist, which is how we ended up devoting so much of our street space to motorists. Are you sure that’s the argument you want to pursue? Remember that, to the NYPD, a car is how normal people get around – that’s what happens when they and everybody they spend time with is granted license to park on the sidewalk or in the bike lane. Any other way of getting around is a game. They see your bicycle as a toy, so who cares if you sometimes have to take your toy somewhere else? Insist that they park legally, and suddenly the notion of walking, cycling, and riding transit for real transportation won’t seem quite so outlandish to them. Put the damn barriers in a lane of traffic. Viola, protected bike lane. I don’t see why he shouldn’t. The argument here isn’t about cars versus bikes – that argument has enough to settle it already. Cars kill and pollute and bikes don’t. The fact that cars “need more space” than bicycles doesn’t even begin to override those arguments. I would have loved to have an air horn at that moment.